Xinmin Li earned his M.S. in quantitative genetics in China and PhD in molecular genetics at the University of Nottingham in the United Kingdom. 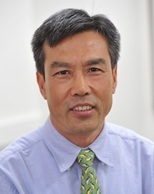 After he completed his post-doc training at the University of Adelaide in Australia, Dr. Li was appointed as assistant professor in the Department of Medicine, Loma Linda University in 1999. From 2001-2007, Dr. Li was a Senior research Professional (PI) and Director of Functional Genomics facility at the University of Chicago. He joined the UCLA faculty in 2007 as Professor of genomics. Dr. Li's research focuses on the identification and characterization of genetic variations that affect complex diseases. He uses an integrated genomic approach to investigate global mRNA/miRNA expression, copy number variation, single nucleotide polymorphism and DNA-protein interaction by primarily using microarray-based technologies for initial screening and siRNA/miRNA-mediated technologies for functional screening. His ultimate goal is to identify genetic variations of clinical importance. Xinmin Li*, Richard J. Quigg, Jian Zhou, Weikuan Gu, Nagesh Rao, Elaine F. Reed Clinical Utility of Microarrays : Current Status, Existing Challenges and Future Outlook.. Current Genomics in press 2008; . Zhongyi Zhang, Weihua Yuan, Lin Sun, Frances L. Szeto, Kari E. Wong, Xinmin Li, Juan Kong, and Yan Chun Li 1,25-Dihydroxyvitamin D3 Suppresses High Glucose-Induced MCP-1 Expression in Mesangial Cells by Targeting NF-?B. . Kidney International 72, 193?201. 2007; . Xinmin Li, Hali Wang, Edward Touma, Yuchen Qi, Emma Rousseau, Richard J. Quigg, James T. Ryaby TP508 Accelerates Fracture Repair by Promoting Cell Growth over Cell Death.. Biochem Biophys Res Commun 364(1):187-93. . 2007; . Sharff Katie A, Song Wen-Xin, Luo Xiaoji, Tang Ni, Luo Jinyong, Chen Jin, Bi Yang, He Bai-Cheng, Huang Jiayi, Li Xinmin, Jiang Wei, Zhu Gao-Hui, Su Yuxi, He Yun, Shen Jikun, Wang Yi, Chen Liang, Zuo Guo-Wei, Liu Bo, Pan Xiaochuan, Reid Russell R, Luu Hue H, Haydon Rex C, He Tong-Chuan Hey1 basic helix-loop-helix protein plays an important role in mediating BMP9-induced osteogenic differentiation of mesenchymal progenitor cells.. The Journal of biological chemistry. 2009; 284(1): 649-59. Qiang Wang, Youli Wang, Andrew W. Minto, Jinhua Wang, Qun Shi, Xinmin Li, and Richard J. Quigg MicroRNA-377 is up-regulated and can lead to increased fibronectin production in diabetic nephropathy.. The FASEB journal : official publication of the Federation of American Societies for Experimental Biology. 2008; . Jiao Yan, Jin Xiudong, Yan Jian, Zhang Chi, Jiao Feng, Li Xinmin, Roe Bruce A, Mount David B, Gu Weikuan A deletion mutation in Slc12a6 is associated with neuromuscular disease in gaxp mice.. Genomics. 2008; 91(5): 407-14. Wang Qiang, Li Yan Chun, Wang Jinhua, Kong Juan, Qi Yuchen, Quigg Richard J, Li Xinmin miR-17-92 cluster accelerates adipocyte differentiation by negatively regulating tumor-suppressor Rb2/p130.. Proceedings of the National Academy of Sciences of the United States of America. 2008; 105(8): 2889-94. Schrump David S, Fischette Maria R, Nguyen Dao M, Zhao Ming, Li Xinmin, Kunst Tricia F, Hancox Ana, Hong Julie A, Chen G Aaron, Kruchin Evgeny, Wright John J, Rosing Douglas R, Sparreboom Alex, Figg William D, Steinberg Seth M Clinical and molecular responses in lung cancer patients receiving Romidepsin.. Clinical cancer research : an official journal of the American Association for Cancer Research. 2008; 14(1): 188-98. Jiao Yan, Yan Jian, Jiao Feng, Yang Hongbin, Donahue Leah Rae, Li Xinmin, Roe Bruce A, Stuart John, Gu Weikuan A single nucleotide mutation in Nppc is associated with a long bone abnormality in lbab mice.. BMC genetics. 2007; 8(1): 16. Yan Jian, Jiao Yan, Jiao Feng, Stuart John, Donahue Leah Rae, Beamer Wesley G, Li Xinmin, Roe Bruce A, LeDoux Mark S, Gu Weikuan Effects of carbonic anhydrase VIII deficiency on cerebellar gene expression profiles in the wdl mouse.. Neuroscience letters. 2007; 413(3): 196-201. Yan James T, Jiao James T, Li James T, Jiao James T, Beamer James T, Rosen James T, Gu James T Evaluation of gene expression profiling in a mouse model of L-gulonolactone oxidase gene deficiency.. Genetics and molecular biology. 2007; 30(2): 322-329. Li Xinmin, Wang Hali, Touma Edward, Rousseau Emma, Quigg Richard J, Ryaby James T Genetic network and pathway analysis of differentially expressed proteins during critical cellular events in fracture repair.. Journal of cellular biochemistry. 2007; 100(2): 527-43.